The Jeffree Star Blue Blood Palette is finally here! This is such a unique looking palette, in both the color story and packaging, that I knew I had to snag one. I LOVE blue eyeshadow, even though I don't wear it too often because a lot of blues can be tricky to work with. I like that there's a lot of "different" blues in this one, colors you don't see too often in palettes. 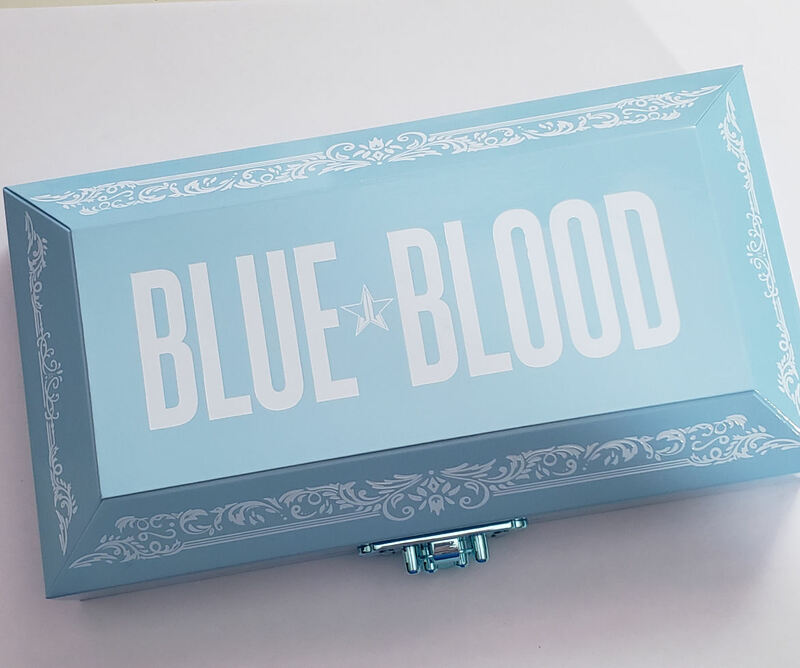 The palette itself is coffin-shaped and the little baby blue chrome clasp on the front is gorgeous! I initially thought the palette would be plastic from all the photos I had seen, but it is in fact cardboard. Very sturdy and well-made, though. There is a large mirror inside. The palette is pretty big, as it is the same length and width as Blood Sugar but slightly thicker because of the raised top to give it that coffin look. Now let's get into what the inside looks like! 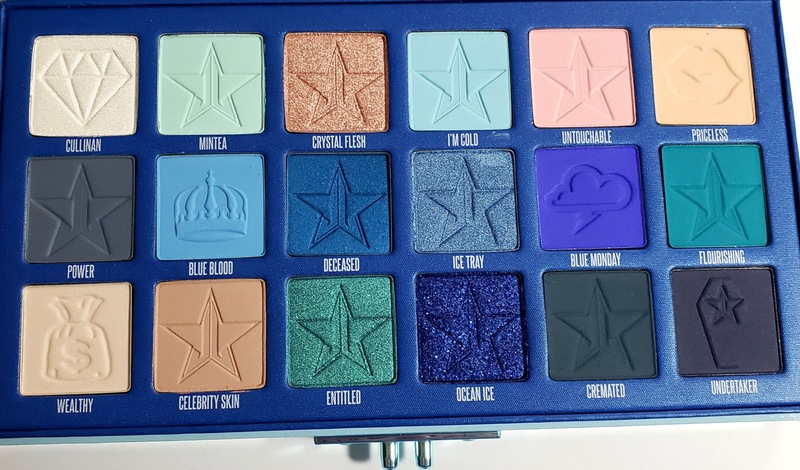 There are 18 shades, and some of them have cute little designs stamped on them just like in his last few palettes. As you can see, there are some neutral shades in here which are much needed in a palette like this to help blend out and tone down the brighter, harsher shades. Cullinan is a shimmery white. Mintea is a matte pale mint green. Crystal Flesh is a metallic pinky champagne. I'm cold is a matte baby blue. Untouchable is a matte baby pink. Priceless is a matte pale peach. Power is a matte blue-gray. Blue Blood is a matte bright blue. Deceased is a metallic aqua blue. Ice Tray is a metallic icy cornflower blue. Blue Monday is a matte bright blue. This one is a drier texture and pretty patchy. Fluorishing is a matte bright teal. Wealthy is a matte cream. Celebrity Skin is a matte beige. Entitled is a metallic teal. Ocean Ice is a glittery metallic deep blue. Cremated is a matte greenish grey-blue. Undertaker is a matte deep navy. 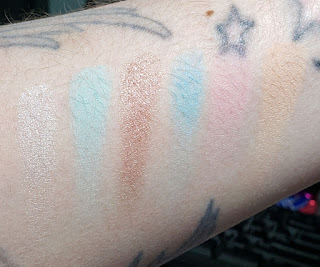 As far as the quality of the shadows, this palette is pretty on par with the Blood Sugar palette (which still happens to be my absolute favorite from JSC). However, there are a few that have a drier consistency and take a bit more work to get them to apply well. 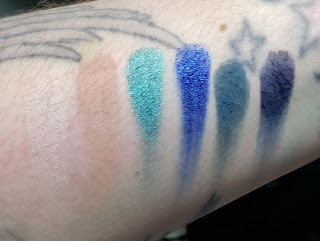 The first is Blue Monday - that looks like a super bright blue in the pan, but feels dry and applies patchy. It's definitely the worst in the palette. 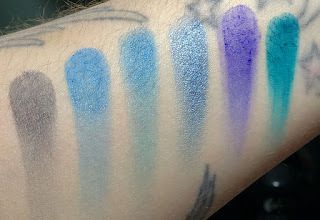 Ocean Ice is another that feel pretty dry and gritty because of the larger glittery particles, and does not really pick up on a brush. However, it is BEAUTIFUL applied with your finger. It's almost like once it's blended on the skin, the larger particles just melt into a metallic awesome finish. And lastly, Undertaker is a pretty dry one as well, but it isn't too terribly hard to apply. Just needs a little extra blending and it's great! I really enjoy the palette so far and I'm happy that shades like Wealthy, Celebrity Skin and Priceless were included to help blend the darker shades! It is DEFINITELY not a palette for everybody, but I've got to say it's beautiful and something unique and different to add to my collection!